The drum chipper is advanced equipment to produce woodchips and is used in paper plants, particle board plants, and fiber-board plants. It cuts logs and small pieces of wood into high quality chips of even length and uniform chip thickness. It is also suitable for the chipping of branches, twigs and planks. The chip length differs in accordance with the requirements of paper plants, particle broad and other fiber-board industries. 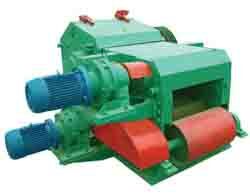 To meet this demand, our company has improved upon different kinds of drum chippers. Added features have made the machines ideal for chip production for markets around the world.